Stan White and traded quick portraits. 3:30 am alarm clock buzzers are hard to do, but today I woke right up and didn't feel tired at all. 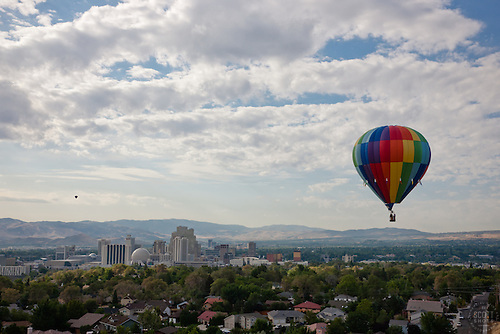 Shooting the Great Reno Balloon Race from a hot air balloon was on my to-do list. But right when I walked out the front door, FLASH... roooaaar, lightning and thunder. OH NO. I got in my 4Runner and headed down the hill to Reno anyway. 15 minutes later it was pouring rain. What was I thinking, I wanted to turn my vehicle around and go back to bed, this was a disappointing waste of time. When I got to San Rafael Park in Reno, it was still dark and slightly raining. The topics of conversation among the pilots and crew were mostly weather related and whether or not they would fly. A little helium balloon with a glow stick attached to it was sent up into the air and seemed to be moving along more horizontal than vertical. Sigh. But after a while, the sun started to rise, the weather calmed down, the clouds started to clear and it was announced that the balloons could launch, if they wanted to... The pilot I was matched up with told me right away he wasn't sure if he was comfortable flying in the winds we were still having. He had a frog shaped balloon that was a little harder to fly and land in questionable conditions. A little while later, he made the call, we would not fly today. NOOO!!! I thought but said "I understand and thank you for keeping me safe." Then I quickly found the event organizer I was shooting for and told her I would not be able to get her the photos she wanted unless she could find me another ride. She worked her magic and found me a balloon that the CNN crew was supposed to be in. It was a maybe, if the crew showed up, I was out of luck. 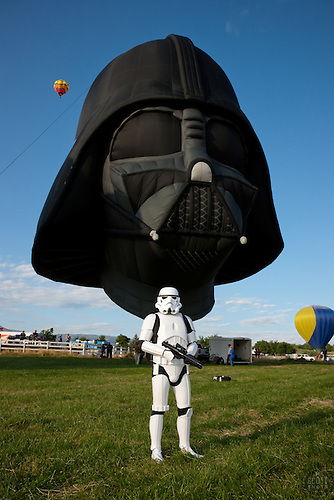 "Stormtrooper and Darth Vader Balloon 1" - This Star Wars stormtrooper and Darth Vader hot air balloon were photographed at the 2011 Great Reno Balloon Race in Reno, Nevada. After what seemed like an eternity, my new pilot said we needed to get going and I was in the balloon!!! YES! As we took off, I looked at my two cameras, looked at the balloon lifting off, and I felt one of those child like feelings you get on your birthday or Christmas morning. We were floating. "Take Off" - This photograph of a hot air balloon firing up and taking off was photographed at the 2011 Great Reno Balloon Race. Photographed from inside the hot air balloon basket. "Balloon Over Downtown Reno" - This hot air balloon was photographed from a balloon during the 2011 Great Reno Balloon Race. 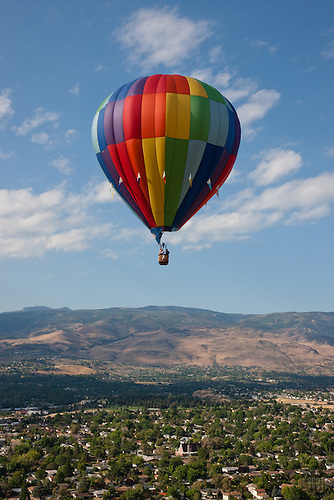 "Balloon Over Reno 2" - This hot air balloon was photographed over Reno, Nevada during the 2011 Great Reno Balloon Race. The "toy" like effect was achieved using a tilt-shift lens. "Ballon Over Reno 4" - This hot air balloon was photographed from a balloon during the 2011 Great Reno Balloon Race. The Great Reno Balloon Race is incredible from the air, but it is just as incredible from the ground. Hot air balloons provide some fun colorful images like these I shot of the event in 2008: 2008 Great Reno Balloon Race. I'm planning on taking my family out this Saturday to catch the Dawn Patrol and for more balloon photos. You should get there as well! Getting up early is worth it. The photos at the Glow Show and Dawn Patrol can be incredible. And parking can be a nightmare later in the morning. A tripod can help capture the Glow Show and Dawn Patrol but remember the balloons are moving. Too slow of a shutter speed can create a blurry balloon. Dress in layers, you'll probably be cold when it's dark and hot as soon as the sun comes out. If you arrive when it's dark, have a flashlight. Not just to see your camera but there is little mud holes and mini streams throughout the park. 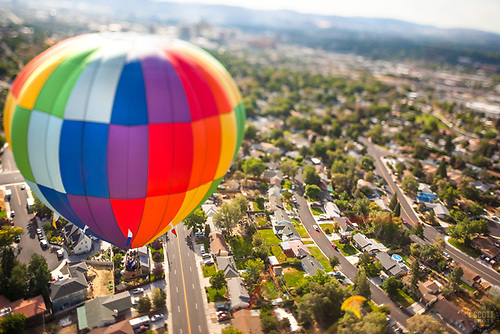 A tilt-shift lens can be a lot of fun and can give you a "toy" like look to your balloon photos. 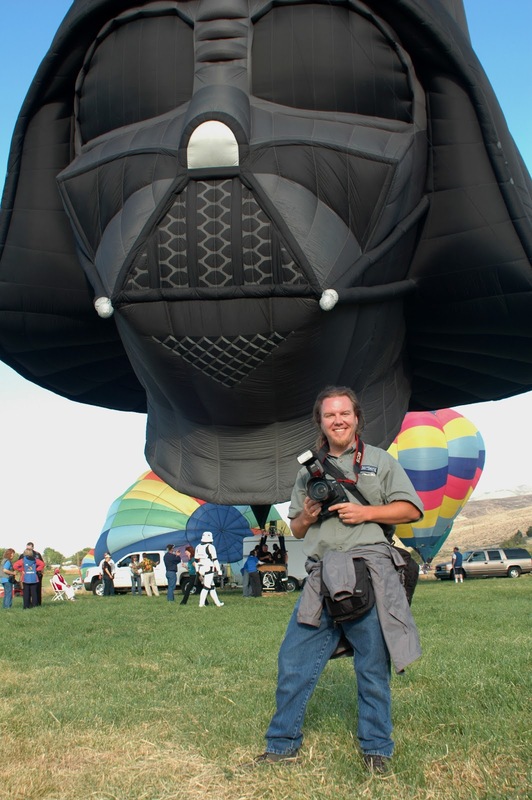 Don't be afraid to go right up to the balloons for photos or to talk to the pilots and crew when they are on the ground. That's one of the things that makes this event so cool. But move out of the way if they need you to. Reflections on nearby ponds can double the amount of balloons in your photo like this balloon photo from 2008. Only pack your photography gear, there are food booths available. They could use the support and your spine wants to support a lighter backpack. 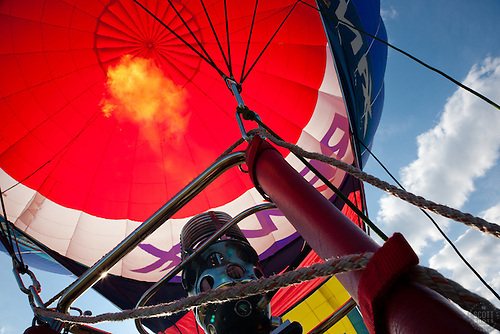 If you get to shoot from a hot air balloon, pack minimal gear. Most of the baskets are small, I'm glad I left my big backpack style camera bag in the 4Runner. Also, the landing can be a little rough, protect your gear. My cameras bumped around a bit when I crawled out of the basket that ended up on it's side. Hope you enjoyed my story and tips. Please enjoy the slide show below. If you have any questions about shooting the event, please ask in the comments area. More info about the event can be found at www.RenoBalloon.com Thank you! Click on any image above to order fine art prints, gift items, or to license and download as stock photography.